Muralitheran Raaja was arrested under the Prevention of Terrorism Act (PTA), a law that imprisons anyone "suspected" of having links to terrorism. In 2011 he was released and cleared of all charges. During his detention, his injuries were never treated. Colombo (AsiaNews) - "As suspected terrorist, I was taken to the police station Teldeniya. There, under the eyes of my mother, a dozen policemen beat me with kicks and punches. I had burns on my legs and wounds everywhere. The police tortured me all night. " So begins the testimony of Muralitheran Raaja, familiarly called Murali, a young native of Kandy (Central Province, Sri Lanka), who was arrested and imprisoned under the Prevention of Terrorism Act (PTA), the law allows the detention of anyone with suspected links to LTTE rebels (Liberation Tigers of Tamil Eelam). After three years in prison on 8 December 2011, the High Court of Jaffna ordered his release without bail. Muralitharan belongs to a Hindu family, but calls himself a strong believer in Jesus Christ. Free again, he found the help and support of Fr. Nandana Manatunge, who heads the Office for Human Rights of the diocese of Kandy. After a long process of rehabilitation, the young man decided to share his dramatic experience during a seminar dedicated to the survivors of the civil war, which was attended by about 60 people. 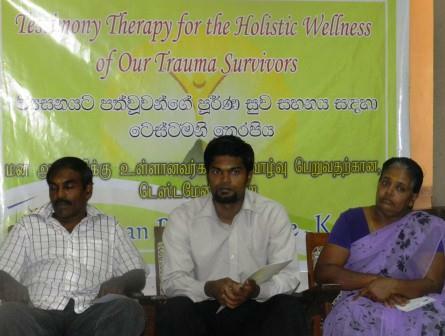 At the meeting, held at Fatima Retreat House Lewella (Kandy), he attended with his parents. "After Teldeniya - continues Muralitharan - I was detained in the Manikhinna police station for four months. On September 25, 2008 I met the Kandy magistrate for the first time, who ordered my transfer to prison Bogambara. I was never visited by the medical commission, nor did I ever receive any treatment for my wounds. Eventually, the prosecutor filed charges against me to the High Court of Jaffna. After five hearings, the court ordered my release the 8 December 2011, clearing me of all charges. " After the young man's testimony, Fr. Manatunge spoke: "Prison conditions in Sri Lanka are horrifying. The mere fact of being locked in an over crowded remand prison is physical and mental torture. I met Murali when he was in Bogambara prison, and I could understand how much suffering he had to endure. Many believe that the detainees should live in inhuman conditions, only to later claims that they [too] are human beings." According to the priest, even if "Murali was strong, he managed to survive, and is here today to talk with us," it is necessary "to launch a campaign calling on the government to sign the OPCAT (Optional Protocol to the Convention against Torture ), the Office of the UN High Commissioner for Human Rights (UNHCR), and make the country's prisons livable. " New anti-terror laws, another "state of emergency"